Used on influential Yardbirds tracks as “I’m a Man,” “Heart Full of Soul,” “Over Under Sideways Down” and “Shapes of Things" before Beck switched over to a Les Paul early in 1966. 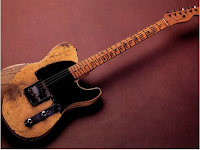 Beck bought the guitar from John Walker of The Walker Brothers who had shaved the body to have the contour of a Stratocaster. “When Jeff first got it, it had a white vinyl pickguard as can be seen in earlier Yardbirds videos and photos. Jeff replaced it with a black Esquire pickguard with a 5 hole pattern and two distinctive chips on the top edge and lower neck slot. Jeff liked the contrast and it looked like the Teles made just a year earlier." “Jeff could manipulate the volume and tone controls giving it a wah-wah effect as in ‘Train Kept A Rollin'’ or ‘Still I'm Sad.’ The lever switch would give full treble in the bridge position, variable tone control in the center and full bass in the front position. The bridge pickup has slightly staggered poles. The body was made in 1954 and the neck was replaced with one made in 1955.